M/V HHL New York, passing through the Dardanelles with the first Pomornik class hovercraft of PLAN to China. Photo: Mr. Ahmet Güven. The Pomornik (Project 1232.3) class hovercraft built for the PLAN passed through the Turkish Straits; but not on her own power. 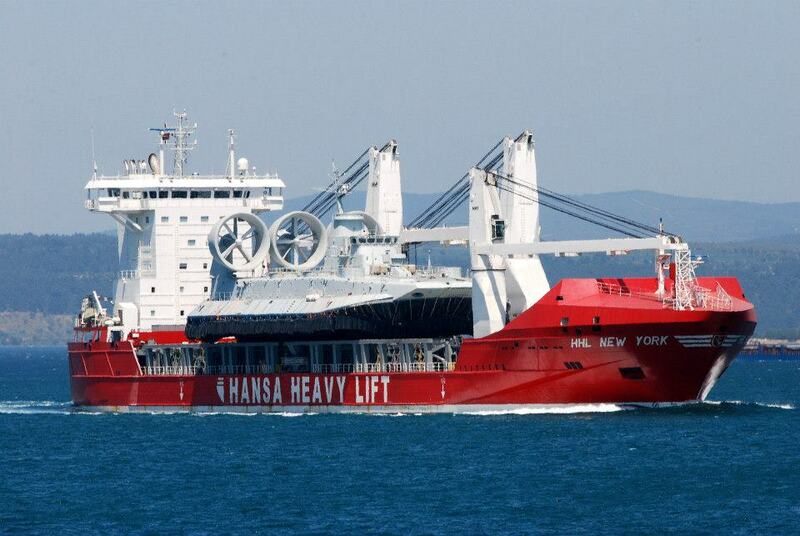 The craft was on board of M/V HHL New York, a special ship designed for large and difficult cargo. M/V HHL New York left the Ukrainian port Feodosia on 27 April 2013 and passed through Bosphorus on 30 April 2013 in the early hours of before sunrise. She passed through the Dardanelles later the same day. This hovercraft , the world largest, is the first one of a class of four. The second one will also be constructed in Ukraine by JSC Feodosia Shipbuilding Company. The third and fourth vessels will be produced in China with Ukrainian help. The ship was built at JSC “Feodosia shipbuilding company” Sea “, which is part of DC” Ukroboronprom “for the needs of Chinese navy. Currently, the company continued the construction of the second ship of Project 958 for the Chinese customer. Under a contract signed before the JSC “Feodosia shipbuilding company” Sea “for the Chinese navy will build two amphibious hovercraft project 958. Two of these vehicles will be built with the participation of Ukrainian specialists in the use of domestic components in China. The world’s largest amphibious landing hovercraft Project 958 is designed to receive unequipped or equipped with a bank of equipment and personnel marines, shipping them by sea, landing on unequipped coast and fire support landing forces.It can also make transporting mines and setting mine barrages.